Pennsylvania Cable And Satellite TV Installer Insurance. As a cable or satellite television installer, there are certain types of insurance that you're going to have to carry. Most of these insurance types are optional, at least in the sense that they are not required by law, but they are still absolutely vital to this type of business - and required by many of the large companies that hire installers. Cable and satellite television installers are working with utility poles, sometimes high in the air or on roofs, and have access to people's homes. All of this means that you need as much protection as possible before you begin servicing customers. Cable and satellite TV installers handle telecommunication services like installing cable or satellite TV for residences and businesses. They also can do telephone, data installation, and high-speed internet installation. Due to the nature of their job, they may be installing or upgrading services by entering tiny crawl spaces or attics, and are frequently on ladders when installing satellite dishes. They are also at risk for injuring themselves or others from working with electricity. and many others require the independent contractor installers to carry certain types of commercial insurance to install for them. The first type of insurance is called general liability. General liability insurance is a type of insurance that covers you when things happen as part of your regular business tasks. For example, if you were to accidentally destroy someone's television or satellite setup and had to replace these electronics, general liability insurance may cover you. In addition, it covers things like damage from the installation of underground cables that interfere with electrical or sewage lines, accidents that happen at the actual business location and various other things that could make you liable in the lawsuit. Inland Marine insurance coverage is a certain type of Pennsylvania cable and satellite TV installer insurance coverage that is intended for businesses that do a great deal of their work mobile. 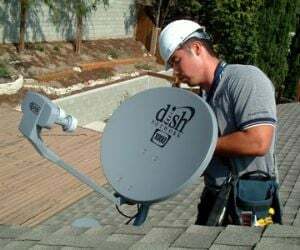 Satellite and television cable installers have to travel to PA customers' homes to install satellite dishes, cable lines, cable boxes and more. Many satellite and television installers work exclusively out of their truck. All of their equipment is located in there as well. Inland Marine coverage covers things like damage to an installer's tools and equipment when they are out doing their job, theft of those tools and equipment and more. Business property insurance is important for companies that have a PA physical location that they do business out of. Property insurance protects companies from things like theft, fire, natural disasters and more. In the case of a cable or TV installer, there may not be much face-to-face time with customers at a physical location, but you are still going to have employees that work at that location including people that set up installer appointments or do customer service, administrative staff and storage of equipment for installers. The income from a satellite or cable installer business might stagnate at certain points and make it difficult for installers to respond to calls or do new installations because their equipment or tools were stolen or damaged. Business income insurance protects you against this. Although this is not required, and most people do not use this option to protect themselves against loss of income, with cable and TV installer job specifically, it can be a useful addition because there are so many variables that can control whether or not you get work. If you have other employees that are installing cable or satellite dishes, or you have employees that work on site that do customer service or set appointments, then you may need worker's compensation insurance. Workers Comp protects employees who are injured on the job. This is especially important for cable and satellite TV installers, because the work can be dangerous. In addition, workers compensation insurance is actually required by law in most states if you have any employees that earn a salary or are paid by the hour. You are definitely going to need commercial automobile insurance as a PA cable or satellite TV installer. Since you are going to be working out of your vehicle most of the time, commercial auto insurance is required. Business auto insurance protects you the same way that regular car insurance does, but it is specifically designed for people that use a vehicle for their job. Some other types of insurance that you may want to consider include; equipment breakdown insurance, which keeps you safe in case of a major equipment breakdown that can cost you so much that your business cannot keep up, cyber liability insurance which is important if you are taking customer information like credit cards. employment related practices insurance which keeps you safe from suits like sexual harassment or discrimination and umbrella coverage which offers additional liability protection. Request a free Pennsylvania Cable And Satellite TV Installer insurance quote in Aliquippa, Allentown, Altoona, Ambridge, Baldwin, Beaver Falls, Bellevue, Berwick, Bethel Park, Bethlehem, Bloomsburg town, Bradford, Brentwood, Bristol, Brookhaven, Butler, Camp Hill, Canonsburg, Carbondale, Carlisle, Carnegie, Castle Shannon, Chambersburg, Chester, Coatesville, Collingdale, Columbia, Connellsville, Conshohocken, Darby, Dormont, Downingtown, Doylestown, DuBois, Dunmore, East Stroudsburg, Easton, Economy, Elizabethtown, Ellwood, Emmaus, Ephrata, Erie, Franklin Park, Gettysburg, Glenolden, Greensburg, Grove, Hanover, Harrisburg, Hatboro, Hazleton, Hermitage, Huntingdon, Indiana, Jeannette, Jefferson Hills, Johnstown, Kingston, Lancaster, Lansdale, Lansdowne, Latrobe, Lebanon, Lewistown, Lititz, Lock Haven, Lower Burrell, McKeesport, Meadville, Mechanicsburg, Middletown, Millersville, Milton, Monessen, Monroeville, Morrisville, Mount Joy, Munhall, Murrysville, Nanticoke, New Castle, New Cumberland, New Kensington, Norristown, Northampton, Oil, Old Forge, Palmyra, Perkasie, Philadelphia, Phoenixville, Pittsburgh, Pittston, Pleasant Hills, Plum, Pottstown, Pottsville, Quakertown, Reading, Ridley Park, Scranton, Shamokin, Sharon, St. Marys, State College, Sunbury, Swissvale, Tamaqua, Uniontown, Warren, Washington, Waynesboro, West Chester, West Mifflin, White Oak, Whitehall, Wilkes-Barre, Wilkinsburg, Williamsport, Wilson, Wyomissing, Yeadon, York and all other cities in PA - The Keystone State.